Burton deserves credit for making this film not nearly as dark as many of his other features and the vibrant colors of the circus are definitely a departure from his usual darker tones. In the past five years, The Walt Disney Studio has been reworking their animated classics and turned them into live action features. While many (myself included) were skeptical at first, Disney has managed to create some wonderful films that the whole family can enjoy, whether seeing it for the first time or reminiscing about the stories they know and love. The studio's latest venture is their fourth animated feature from 1941, Dumbo. The beloved baby elephant with the giant ears has stolen hearts for generations and with this retelling, Disney opens it up to a whole new audience. While not the same storyline as the original, the film envelopes the essence what Dumbo is all about. As the film opens we see the members of the Medici circus getting ready to travel across the country preparing to entertain families. Among the group are Milly and Joe (Newcomers Nico Parker and Finely Hobbins) Farrier – the children of the former circus star Holt (Coin Farrell; In Bruges). Holt returns from the war with one arm missing and becomes the baby elephant keeper after he finds out his horses, the centerpiece of his act, had been sold when the circus fell on hard times. Milly and Joe, despite their father's orders, spend time with the baby elephant and discover he can fly. Once word gets out everyone flocks to see this magical creature and the circus is once again making money. When wealthy Dreamland owner Vandevere (Michael Keaton; Spotlight) makes Medici owner Max ( Danny Devito; It's Always Sunny in Philadelphia) an offer to bring his whole circus to Dreamland and part ownership Max can't refuse. However, everything isn't always as it seems and after a short while Holt, the kids and Max realize Vandervere isn't as generous as he seems. Ultimately, they devise a plan to set Dumbo free and reunite him with his mother much to Vandervere's dismay. You would think Dumbo's stellar veteran cast it would be well acted but this isn't necessarily the case. The children do a good job and Eva Green (Casino Royale) is wonderful as the Parisian trapeze artist at Dreamland who helps Dumbo escape but Farrell is rather wooden and stiff and Keaton plays a version of himself so you never seem to forget the actor behind the character. Devito is ok but much of his dialogue is cliché. Director Tim Burton (Edward Scissorhands) adds his usual darker sensibilities to this film especially at certain points in Dreamland. The CGI effects, however, are fairly good except for one or two moments when it becomes quite obvious that there is CGI at play here. The script isn't awful but it isn't wonderful either. The original story of Dumbo ends about 20 minutes into the film and then a whole brand new story plays out for the next hour and a half. However, fans of the original will find little moments here and there that pay homage to the original but if you were waiting for the classic in its entirety you are going to be sorely disappointed. 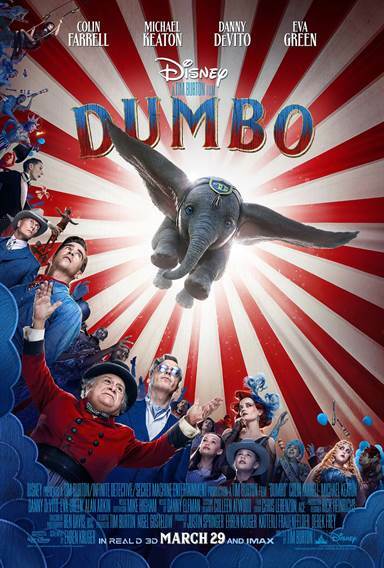 This Dumbo is sweet and sentimental and offers a little bit of awe and wonder but it is not the wonderous and magical extravaganza I think many of us had hoped for. The dialogue and storyline are generic which may be why the actors come across and somewhat unmemorable. I give Burton credit for making this film not nearly as dark as many of his other features and the vibrant colors of the circus are definitely a departure from his usual darker tones. Dumbo isn't bad, it just isn't great which is what I'm guessing many fans will be expecting. It is sweet and sentimental and if you go in with lower expectations you won't be disappointed. Download Dumbo from the iTunes Store in Digial HD. For more information about Dumbo visit the FlickDirect Movie Database.